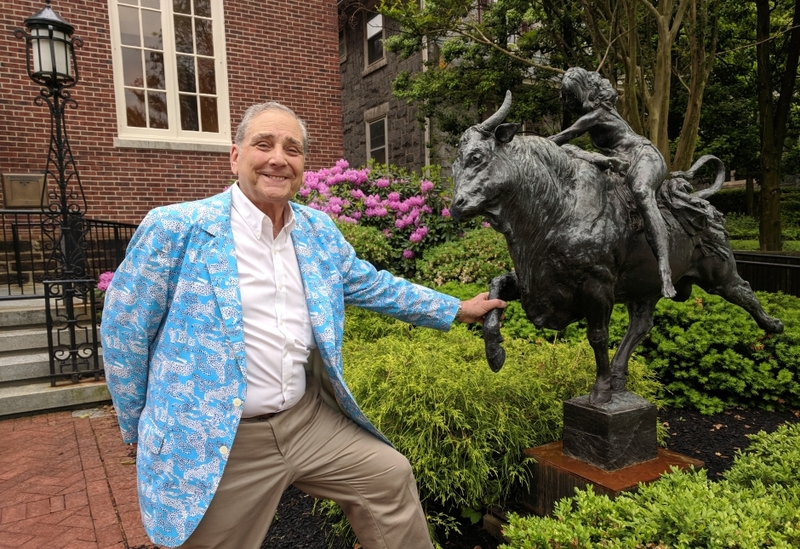 Haddonfield Outdoor Sculpture Trust chair Stuart Harting poses with "Europa" outside the Republic Bank in Haddonfield. Credit: Matt Skoufalos. Now in its fifth year, the nonprofit public arts program has installed more than a dozen works of art in the borough, with more planned for the future. “Steadfast and Loyal” by sculptor Ken Ross is the newest Kings Highway installation by the Haddonfield Outdoor Sculpture Trust. Credit: Matt Skoufalos. 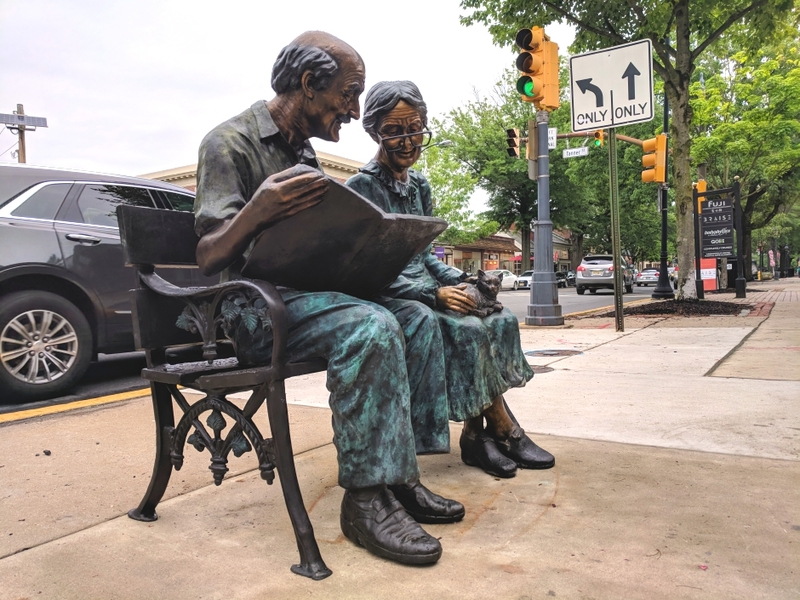 The historic landscape of downtown Haddonfield has seen changes through the centuries, but none quite like what the Haddonfield Outdoor Sculpture Trust (HOST) has been able to produce since 2013. In that time, the independent nonprofit group has installed more than a dozen public works of art on a temporary or permanent basis. Now the organization is planning to build a deeper foundation for its development with an artist-in-residence program in one of the borough-owned buildings on the Bancroft property. Haddonfield commissioners have committed to an agreement whereby HOST will create a sculptor-in-residence program at the carriage house on Hopkins Lane. Mayor Neal Rochford described it as an adaptive re-use of a historic property. “Historic preservation and open-space development in a tax-neutral way have always been our goals for the parcel,” Rochford said. HOST “adds an element of class and an element of interest” to the borough downtown, and “gives you a nice conversation piece,” he said. HOST chairman Stuart Harting said the residency program will be developed for a potential launch in the fall of 2018 at the earliest. Tentative plans would place graduate sculptors from Rutgers and the Pennsylvania Academy of the Fine Arts in two studios to be created within the structure. Sculptor Matt Duffy at the Haddonfield installation of “Low-Poly Open Heart.” Credit: Matt Skoufalos. A $5,000 grant from the Haddonfield Foundation has put the project halfway to covering its $10,000 tools and equipment costs, but the building will require more than that for its redesign. “We need support from the public,” Harting said. Sculptors in residence would potentially create works to support the HOST collection while also earning college credit, living on the grounds, and teaching local artists, he said. Philadelphia artist Miguel Horn of Traction Company said communities that host artists-in-residence programs benefit as much from those opportunities as the sculptors themselves do. It could also be a chance to produce a work that is adopted by the town. Horn, whose work, “Uno,” is on permanent display at the intersections of Mechanic and Tanner Streets, said, “It’s a point of pride” that his work is installed in Haddonfield. Haddonfield resident John Giannotti with his hadrosaurus sculpture on Kings Highway. Credit: Matt Skoufalos. 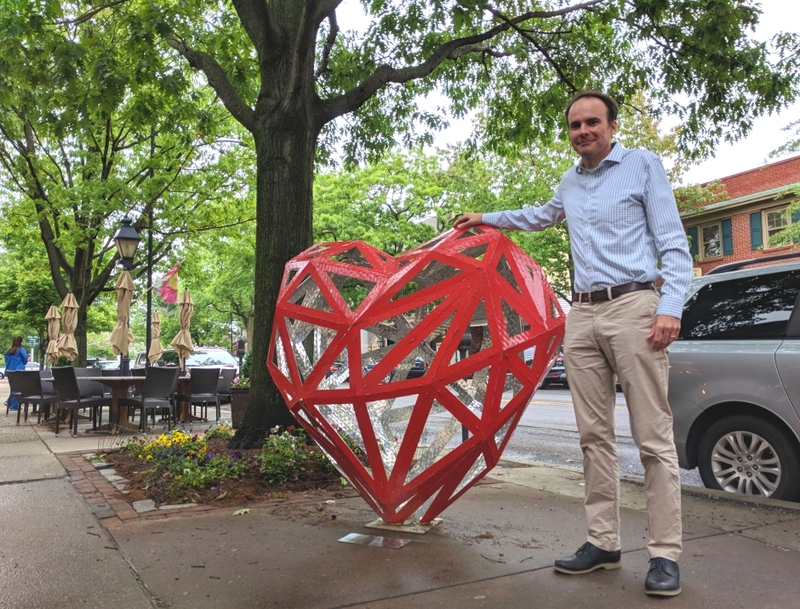 Matt Duffy of Washington, D.C., whose “Low-Poly Open Heart” was installed on Kings Highway this spring, said towns that receive public art installations help artists to continue producing work. Duffy’s sculpture, which was created as a gift for his wife, has been displayed all over the country, from Georgia to Colorado. “It’s a great way to get to know a lot of small towns all over the place,” he said. 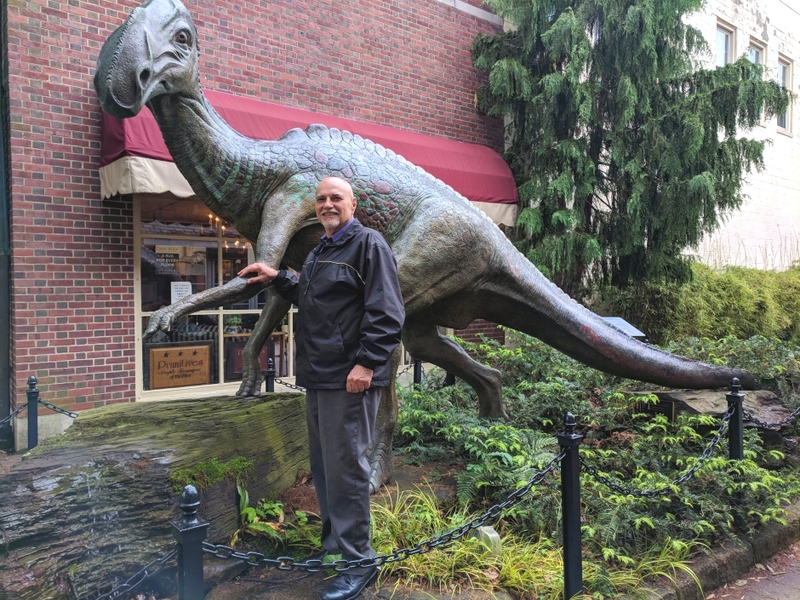 Haddonfield resident John Giannotti, who gifted his hadrosaurus sculpture to the borough years ago, said the addition of public art installations helps visitors and residents explore their communities in new ways.